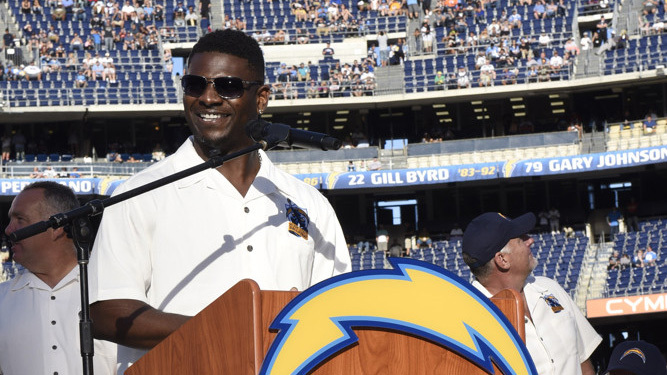 Football Hall of Famer and former Chargers running back LaDainian Tomlinson is pleading with Chargers fans to come back and forgive the team. When the Chargers left San Diego in 2016, the organization didn’t make any effort to hold on to its San Diego fan base. In their first season in Los Angeles, the Chargers the motto was “Fight for L.A.” It seems, they should have fought to keep San Diego fans. Playing in the 27,000-seat StubHub Center, their temporary home until the Los Angeles Stadium in Inglewood is built, the Chargers regularly have trouble getting fans to fill the seats. If it weren’t the opposing teams’ fans, most of the stadium would be empty. And it’s not just that fans aren’t making the 90-minute drive north, they’re not tuning in as well. Chargers ratings have continued to slide since they left San Diego. Between 2004 and 2016, the average season ratings for the Chargers range from a high of 31.6 in 2010 to a low of 24.4 in 2016. Last year, the highest rated game was against Denver on Monday Night Football (17.7). That slide continues this season with the Chargers’ season opener against Kansas City Chief drew an 11.7 Nielsen rating. “At the end of the day, that’s what it’s all about,” he said. Only time will tell if Tomlinson is right, but reactions from San Diegans online after the podcast was posted was nothing short of brutal. This just confirms that the team is freaking out. Spanos made a major miscalculation and the league has certainly noticed. We can only hope the NFL is set to remove Dean as owner and fix this colossal mistake. @RamsNFL are Southern California’s team. The Chargers gave up their piece of the pie when they turned their backs on 56 years of fan loyalty in San Diego.